When it comes to producing the life saving antibiotic penicillin, not all strains of the mold are equal. Although penicillin was discovered in 1928 by Alexander Fleming when he found that a mold known as penicillium notatum stopped the growth of staphylococci bacteria. While this was a pivotal point in medicine, insofar as the discovery was concerned, it didn’t yield a viable method of mass producing penicillin and Fleming was ill equipped to pursue the discovery. It wasn’t until 1938 that Dr. Howard Florey more or less stumbled across Flemming’s work and began investigating the mechanism of action behind penicillium notatum’s bacteria killing powers. While the experiments progressed, it was agonizingly difficult to extract penicillin from the mold cultures—it took a staggering 2,000 liters of mold culture to produce enough final product to treat a single patient. While powerful and life saving, it was as far from efficient as possible. It wasn’t until Dr. Florey joined forces with Dr. Norman Heatley and continued their research in the United States to work with a team of American scientists that they branched out into searching for more effective species of penicillium. Ultimately, the discovery of a new species came down to good fortune. A sharp eyed assistant in their lab, Mary Hunt, found a moldy cantaloupe in the grocery store and thought the mold looked worth investigating. The mold turned out to be penicillium chrysogenum, a strain that yielded hundreds of times more penicillin and, when mutated in the lab using x-rays, could produce over a thousand times more concentrated penicillin than the original strain, penicillium notatum. 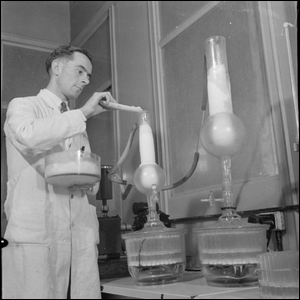 With a high-yield method in hand, pharmaceutical companies were able to easily produce hundreds of millions of units of penicillin and within a matter of years, the per-month production numbers of American pharmaceutical companies rose to the hundreds of billions. Image courtesy of the Imperial War Museum/Wikimedia.